"You get that taste by putting the banana IN the Batman..."
Let's be honest about something. The 1980s were absolutely ridiculous, though often in an adorable, goofy, sort of way. Case in point: It was recently discovered that the July, 1981 issue of Woman's Day contained a mini-magazine from DC Comics that was chock-full of superhero-inspired recipes. 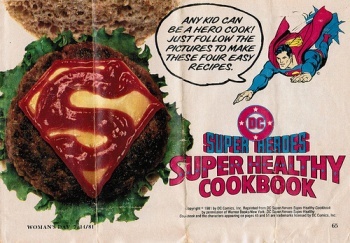 The insert was called the "DC Superheros Super Healthy Cookbook". Based on the photos and recipes on display, this is actually pretty adorable. Aside from the "Mild-Mannered Hamburger", the book also includes gems like Batman and Robin investigating the mystery of the "Invisible Banana French Toast." Oh, yeah, and there's also a guide to creating an army of vegetable robots. This sounds like an awesome geek artifact to add to the collection, but the guide itself isn't cheap. There's currently a copy on eBay selling for $12.99; Amazon also has the book, though the cheapest it's selling for is $88. Maybe we should just stick to enjoying the photos from the book online.